America's Got Talent Finalist - Mandy Harvey! We are beyond excited to have Mandy Harvey as our Featured guest for this years Interdisciplinary Integration Symposium! Mandy will be presenting, "Sensing the Rhythm: Exploring Music without Hearing"
I encourage you to read more about Mandy and all the incredible endeavors shes a part of on her Website! 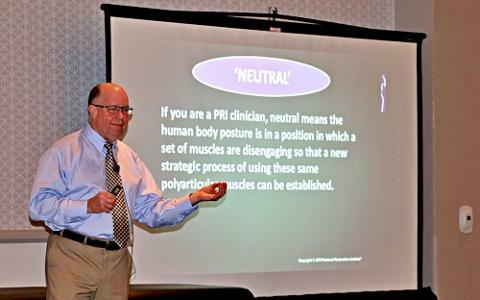 "A PRI Approach to Chiropractic Alignment of The Spine", was presented by Ron Hruska on March 10th at the ACA Rehab Council! The two days prior to this presentation were as significant as the topics being discussed. What culminated as a room full of Chiropractic Doctors Blowing up a Balloon, started with collaborative discussions revolving around concepts such as rotation, orientation, respiration and, perhaps most prevalent, alignment of the spine. Coincidentally these concepts aligned themselves well with what was already being discussed by other vendors, presenters and most importantly Students. After recently attending the APTA Combined Sections and then two months later this conference, it is apparent that the desire to collaborate and integrate among professions is at an all-time high! The students of these organizations are approaching their careers with an Integrative mindset and an overall interest in collaboration. Ron enjoyed discussing the future of this integrative approach with each of the student chiropractors in attendance and was able to show the powerful potential that PRI has within their profession. The group from Keiser University had a strong student presence and a few poster presentations even discussed topics such as the “Zone of Apposition” and Respiration as primary concepts! It was so awesome to see this PRI activity occurring without previous knowledge or awareness of its incurrence! On the second day we were met by PRI Faculty member Dr. Robert “Skip” George, which allowed us to strengthen the Link between the Director of our Institute, a Physical Therapist, and the Chiropractors in attendance. Skip is a walking Reference Center of clinical knowledge and experience, and his input within our discussions was unprecedented. PRI truly is a common language that can be used and utilized by us all, not just one group or another. This particular group of Rehab professionals understood that long before our arrival. They were not only excited and welcoming of our Institute but embraced the collaboration and encouraged it within their own organization. It was quite frankly refreshing to be a part of. With Ron’s presentation falling on the last day of this conference we were excited to see how many attendees stayed around to hear the culmination of Ron’s career. Skip gave a wonderful introduction about his relationship with Ron and this Institute to over 60 filled seats! PRI objective testing and core concepts were strengthened and the use of a few Non-Manual techniques allowed the group to appreciate the ability to integrate it into their daily practice. Thank you to President Dr. Jeff Tucker, and everyone at the American Chiropractic Association Rehab Council for inviting us to this symposium. I would encourage anyone that appreciates this Science to strongly consider reaching out to an integrative minded Chiropractor in their area to collaborate with, converse with and possibly be challenged by, in order to strengthen the relationship between us all! We are excited for the future growth and collaboration between our organizations, and are hopeful that your patients and clients will see a direct increase in their results! Interdisciplinary Integration Symposium Approved for 15 IAOM CE Hours! We are excited to announce that next month's Interdisciplinary Integration Symposium, “Airway Oscillation: An Interdisciplinary Approach to the Production of Voice, Airflow, and Resonance Frequency Breathing” has been approved for 15 IAOM CE hours. If you or anyone you know is a certified Orofacial Myologist, you will not want to miss this years Symposium! Please contact us at 402-467-4111 with any questions you may have, or visit our Website for more information! Jen and I had the pleasure of returning to the APTA Combined Sections Meeting this year in Washington, D.C. Years past have provided us great discussions with both Physical Therapists and Physical Therapy Assistants as well as Students who are seeking these professions. 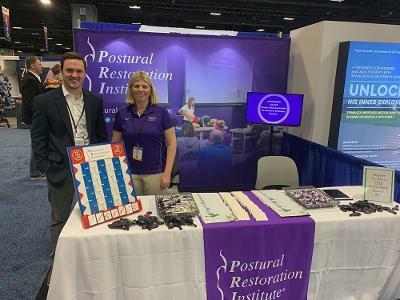 This year once again proved the value of our attendance and allowed us to inform many individuals interested in the science of Postural Restoration. It is so re-assuring and invigorating to be able to discuss our science with those who may not have been exposed prior to attending. The Combination of both PT students and seasoned Physical Therapist's provided a myriad of conversations and allowed us to connect with both sides of the spectrum. Many faculty members from various institutions and organizations asked passionately about our science and wanted to be better at introducing it to their students. Many students asked passionately about finding a PRI Clinician in their area for mentorship and clinical experience as they complete schooling. Interests in specialization areas continues to grow and we were excited to discuss our Affiliate programs in Pediatrics, Geriatrics and all others with those who find interest in these populations. Shortly after a discussion regarding our PRI Integration for Fitness and Movement course we were surprised to see a familiar face come across our booth! Little did we know Julie Blandin was in attendance and literally ran into us amongst the crowd. What a great surprise! Although running into a PRI faculty member was unplanned, we were lucky to have several PRC’s and PRT’s reach out to us as they learned of our stay in the area. On day 2 of the conference we received another surprise as our dear friend and PRT Navin Hettiarachchi sent us a text. “I don’t know how but I have found 3 tickets for you to tonight’s game!”, we had discussed possibly meeting up with Navin but due to the Golden State Warriors coming to town we all thought it would be difficult to find tickets. Although we loved our first NBA experience it was perhaps more fun to see Navin in action with the team. He is a true gift to any organization, as his smile is infectious and his care for his players is unmatched. They are lucky to have him and we are lucky to call him our friend and have him in our PRI Family. We were also able to meet up with PRC Heather Carr, who has been part of the PRI Family for many years. It was great to see her and to meet her husband Jan, as they provided us with local recommendations and things to see. Heather continues to introduce PRI to many others and we are so grateful for her support. Our last evening included a dinner reservation with PRI Faculty Louise Kelly and her husband Bruce and it was such a great way to finish our weekend. Bruce and Louise met in graduate school and it was a true pleasure to take a walk down memory lane with both of them. Although the food was great the conversations shared and laughs that were had truly made our last night in DC special. Thank you to all everyone who made this conference a success. The science of PRI continues to grow and each conference we attend makes it apparent that word of mouth is still one of the best ways to connect and share our passions with others. Thank you in particular to Navin, Heather, Julie and Louise for going out of your way to spend time with us. PRI has a way of connecting people and it was great re-connecting with each of you! Congratulations to the PRT Class of 2019! We are excited to introduce and congratulate our Postural Restoration Trained (PRT) Class of 2019! PRT is the result of completing multiple advanced PRI courses, demonstrating a thorough understanding of the science through completion of the PRT application, and successfully participating in practical and analytical testing. This past weekend, four professionals earned the designation of Postural Restoration Trained (PRT) under the direction of Ron Hruska, Neil Rampe and Jennifer Platt. The Postural Restoration Institute® established this credentialing process in 2011 as a way to recognize and identify individuals with advanced training, extraordinary interest and devotion to the science of postural adaptations, asymmetrical patterns and the influence of polyarticular chains of muscles on the human body as defined by the Postural Restoration Institute®. 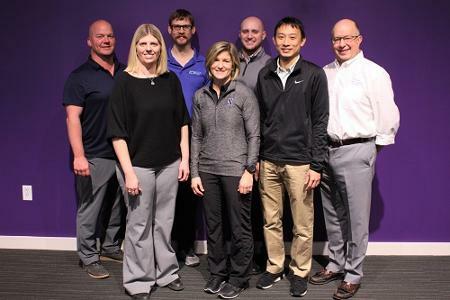 The PRT credential is available to Certified Athletic Trainers, Certified Athletic Therapists, Exercise Physiologists and Certified Strength and Conditioning Specialists who have completed the course requirements, application and testing process. With the addition of this class, there are now 54 PRT professionals throughout the U.S and Internationally. PRT credentialed athletic trainers, strength and conditioning coaches and exercise physiologists offer a unique approach to physical medicine and fitness called Postural Restoration®. This approach addresses underlying biomechanics which can often lead to symptoms of pain and dysfunction. All mechanical influences on the body that restrict movement and contribute to improper joint and muscle position are considered, examined, and assessed. Techniques are utilized to restore proper alignment of the body while proper respiratory dynamics are considered. Management encompasses prevention and lifetime integration for long-term successful outcomes. To view or download all the photos click HERE. We are excited to introduce SYMBA! (Synchronized Movement of Bilateral Asymmetry) As many of you may be familiar with the Pelvis Models that are frequently utilized within the PRI community, you may also begin to see the use of our newest collaboration with the team at SAWBONES. This articulated Ribcage is fully functional in providing visual feedback to your patients or clients and allows many PRI concepts to be demonstrated. We have been working over the past several months to develop this model which allows movement in all three planes! The photos Included below show some of the many prototypes that were created between our staff here at the Institute and the team of engineers at SAWBONES in Vashon, WA. This image shows the initial prototype (Left) which quickly progressed to the smaller size. Sizing and designing of this model required creating a new mold to achieve the desired dimensions which was made from a newly created resin that allows the model to bend and rotate. Initially the spinal column was in a solid state and a new mold and material was again designed to allow flexion and extension of the spine to occur. The team at SAWBONES is top notch and although many of these requirements were difficult to achieve they never gave up and continued designing until these outcomes were met.